Naylor Love Construction is currently working on three separate projects at Sylvia Park Shopping Centre in Mt Wellington, Auckland adding considerable capacity to the centre’s central carpark, a new ﬁve-level carpark building with a total project cost of $36 million, was started in April last year and is due for completion later this year. Located in the previous carpark area, it will provide direct access into Sylvia Park’s new Galleria level, adding an additional 600 spaces. The Galleria will provide 18,000sqm of additional retail space located on the south precinct level one roof top carpark. The new level will provide space for 60 retailers comprising a mix of national and international brands, a café court, glass elevator, roof skylights and new escalators. Construction commenced in March 2018 and is projected to be complete mid-2020. South carpark, being constructed concurrently with the Galleria, is a ﬁve-level carpark building, which will provide 900 carpark spaces. The central and south carparks will be linked with a bridge to create a free ﬂowing mega carpark. There will also be direct access to the carpark from Carbine Road. Constructed from steel frame and concrete with perforated metal panel cladding, the carpark will provide direct access into the new Galleria level. Completion is due mid-2020 and once all projects are completed Sylvia Park will offer about 5,000 carparks in total. The total project cost of the Galleria and south carpark is $223m. These projects follow on from a $15m expansion completed in 2016, which involved constructing the ﬁrst New Zealand store for international fashion retailer ZARA and the renovation of a previous space for the arrival of another New Zealand ﬁrst, fashion retailer H&M. 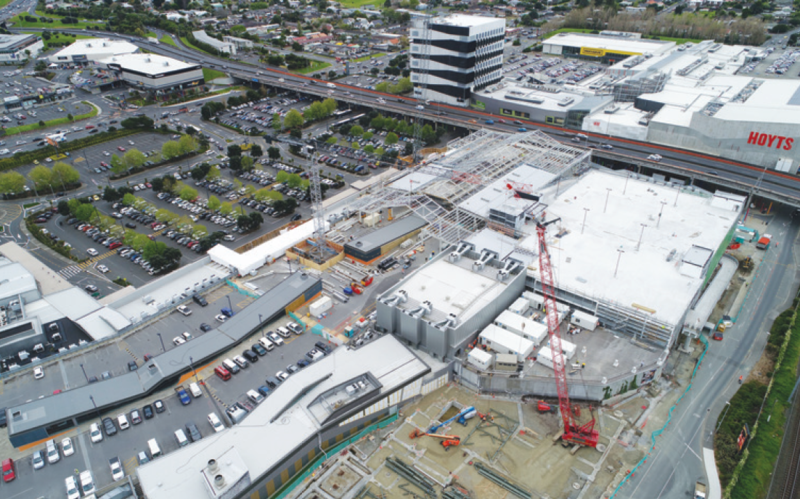 Naylor Love Construction manager Frankie Walkington says that’s what sets Naylor Love’s work at Sylvia Park apart, is that it is being accomplished over a large area with multiple workfaces in a busy live retail environment. He says that the construction company’s commitment to maintaining a safe working and shopping environment and to minimising disruption to Sylvia Park’s day-to-day operations is absolute. “Peeling back the layers of previous developments is never without its surprises but we keep in constant contact with the tenants and centre management to ensure that they can keep trading. Naylor Love is currently working on three separate projects at Sylvia Park adding considerable capacity to the centre’s central carpark. “We want them to be excited about the new development, not to feel like they’re working in a building site,” he says. With work in some areas continuing around the clock, Frankie credits his team’s dedication and experience with keeping the project running smoothly. “The involvement of our carefully selected team of subcontractors and suppliers is also key to this project. “We’ve worked with a number of trusted subs and suppliers for years, and they really go the extra mile for us on projects like Sylvia Park,” he says. Naylor Love has a 118-year history of delivering projects all over New Zealand. With more than 500 staff and ofﬁces in Auckland, Hamilton, Tauranga, Wellington, Christchurch, Queenstown and Dunedin, Naylor Love can call on specialist teams nationwide to participate in a diverse range of projects. As well as the Sylvia Park development, Naylor Love’s current Auckland projects include an extension at Botany Town Centre, an apartment complex in Hobsonville, two separate student accommodation projects for the University of Auckland, the Long Bay Village Centre development and a new retail outlet and national head ofﬁce for the Briscoes Group. The Auckland team recently completed multistorey apartment building Park Residences, the ﬁt-out of the new Tesla showroom in a historic building in Karangahape Road and the Hereford Residences, an award-winning conversion of an ofﬁce building into luxury apartments.